The Little Things In Life offers the bride to be and her attendants a vast selection of bridal accessories which she might need for her wedding and we hope you will find them all here. There is a large choice of wedding jewellery which includes stunning necklace and earring sets with matching tiaras often available. 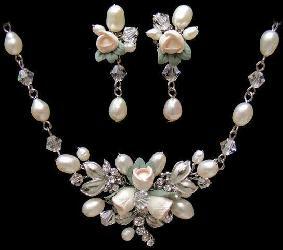 We also offer complete wedding sets as well as necklace sets which include matching bracelets. Much of our jewellery includes freshwater pearls; we also have a good selection of crystal jewellery and other items which include faux pearls, porcelain-like flowers or diamante and we have gold and silver coloured items available. We offer some unusual pieces which are ideal for the Big Day. Brides often wish to wear pearls on their wedding day and we offer a selection of tasteful and beautiful pearl jewellery, much of which is made using freshwater pearls in natural white colour. 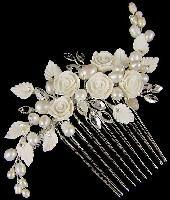 We also stock a large selection of wedding hair accessories: beautiful hair combs, comb tiaras, tiaras and hair flowers, which are now a popular alternative to tiaras. These are also suitable for the mother-of-the bride and also the bridesmaids. Many brides often look for a discrete wedding garter and we can offer a pretty range of these, as well as ivory and white drawstring wedding bags to keep those essential items in on your wedding day. We hope you enjoy browsing through our wedding range and if you have any questions about any of our items, please do not hesitate to contact us.